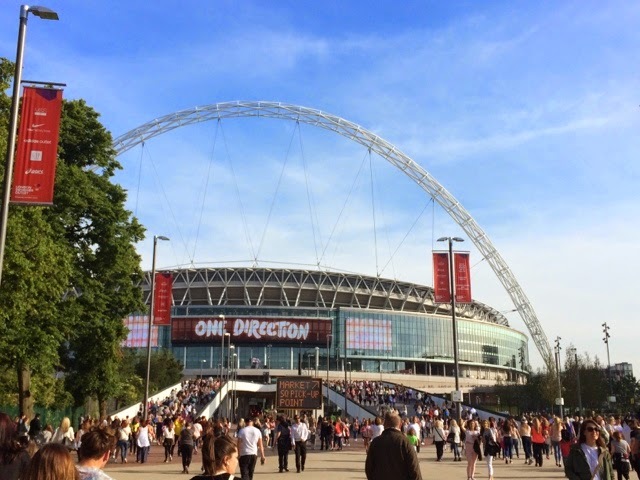 I am so excited to be writing this post as it was a complete and utter surprise that I go to see One Directionperform their Where We Are Tour at Wembley Stadium last Friday night! 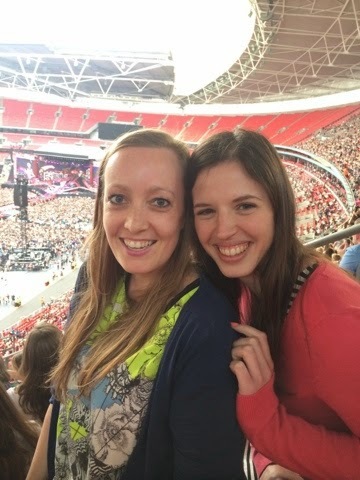 If you follow me on twitter (@emsypickle) you’ll know that I love a good twitter retweet competition – #SorryNotSorry I have won a few goodies this way, but never imagined I would actually win @Little_Mistress‘s RT comp to win tickets to see the world’s biggest boyband perform at one of the biggest stadiums in Europe! Wahooooo!! 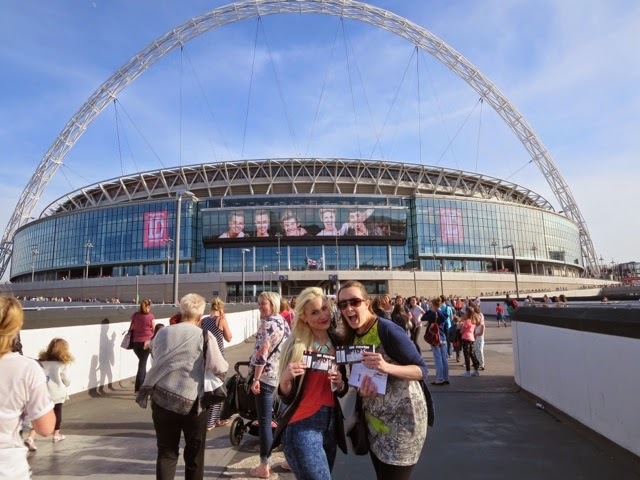 We all met up before the concert and went to the Premier Inn by Wembley Park station, which was hosting a pre-One Direction party with a bar, BBQ and face painting – all raising money for Great Ormond Street Hospital. Well it would be rude not to! They’d run out of Pimms jugs so presented us each with 2-pint glasses of Pimms instead! Hey, it was for charity! 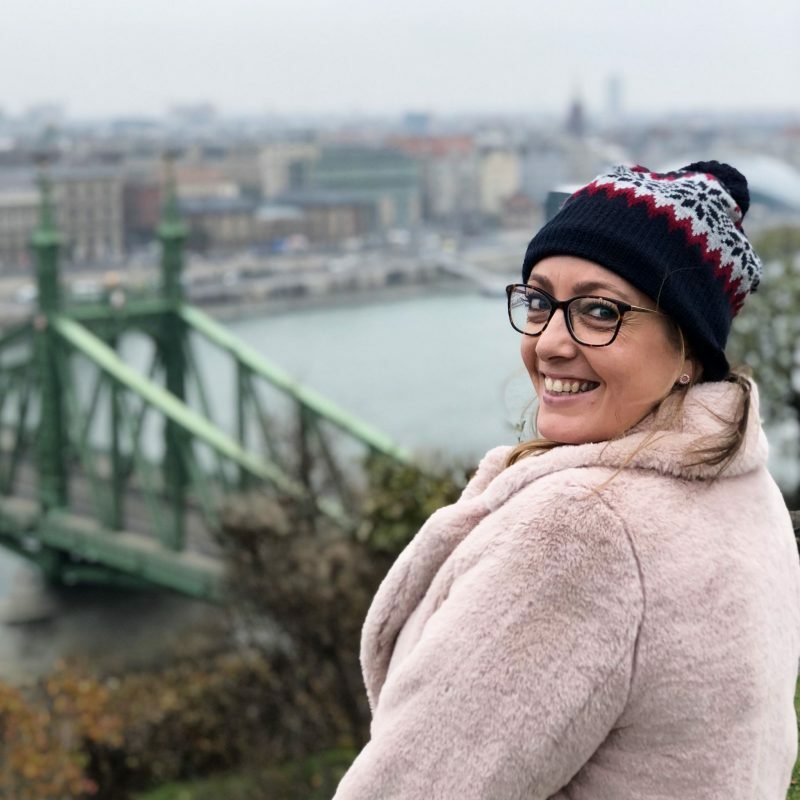 It was so nice to catch up with Ruth and get to know Stefy, all whilst listening to a sound system blaring 1D tracks to get us in the mood! 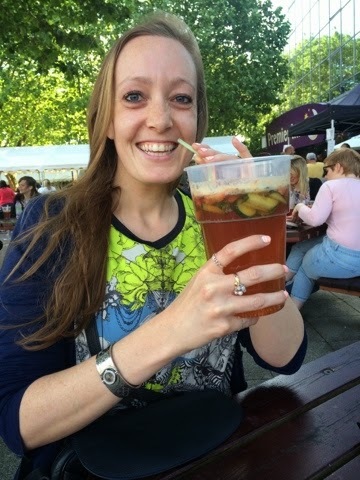 Every glass of Pimms should be as big as your head! 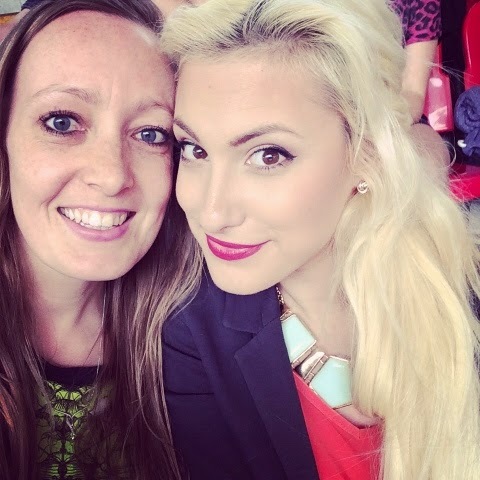 We then headed on down to Wembley Stadium where the fun really began! We had expected huge queues but luckily were ushered straight in and found our seats in the top section of the stadium. Although we were quite high up we still had a great view and were pointing at the front of the stage so didn’t miss any of the action and it was really cool to be able to see the entire crowd. Stefy and I ready to go in! Ruth and I loving our seats! They played all their huge hits (including my fave Kiss You!) 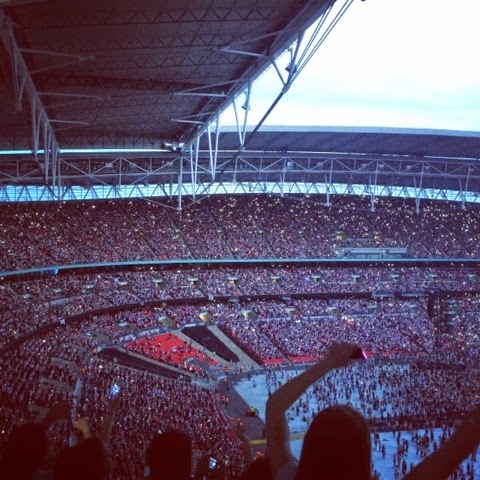 and the crowd were absolutely LOVING IT – I’ve seriously never heard screaming like it! Especially whenever Niall spoke / sang / breathed – everyone LOVED him! 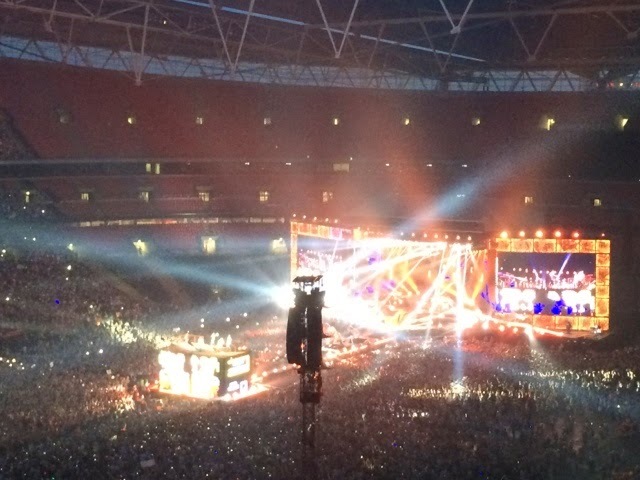 I had no idea he was so popular, I think the crowd was even crazier for him than Harry! The big gigs I usually I go to are DJ sets so it was a really fun experience to be part if a humongous crowd singing along.especially to Little Things which is such a pretty song! I also loved seeing all the lights from the crowd’s camera phones light up the arena, as well as the band’s crazy stage lighting. 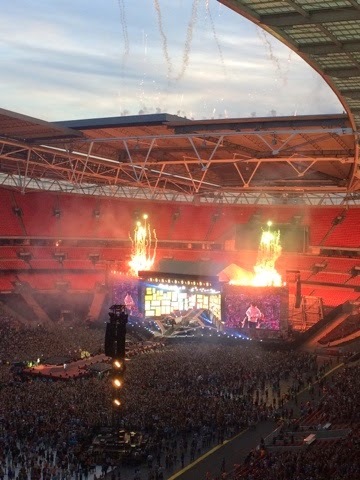 One of my favourite things was the huge amount of fireworks they used in their staging! 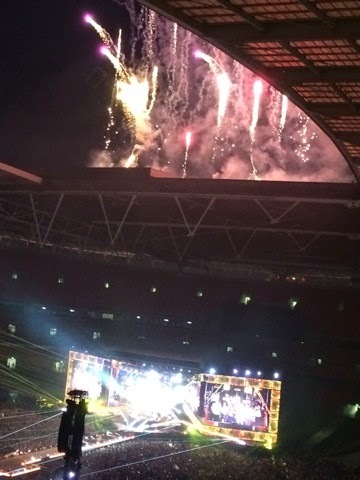 I ADORE fireworks and it was so cool to see them burst out of the stage and out of the roof of the Stadium! Thanks for an unforgettable evening Little Mistress! 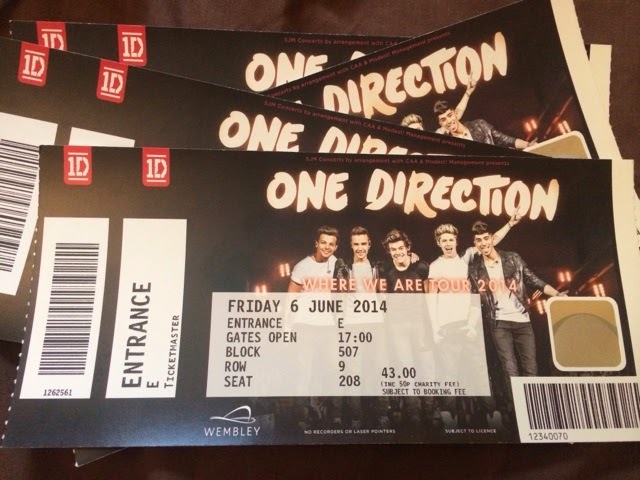 We danced all night to the best song ever……! !